The Rath Yatra or the Chariot Festival is one of the main festival and attraction of Puri, in the state of Orissa. This Rath Yatra Puri festival is held during the monsoon season. The 2017, Puri Ratha Yatra festival is due on 5th July, when a new chariot will be built on a huge structure of wooden wheels. Rath Yatra Puri has always been popular among tourists and they visit Puri every year and take part in the celebrations with full enthusiasm. 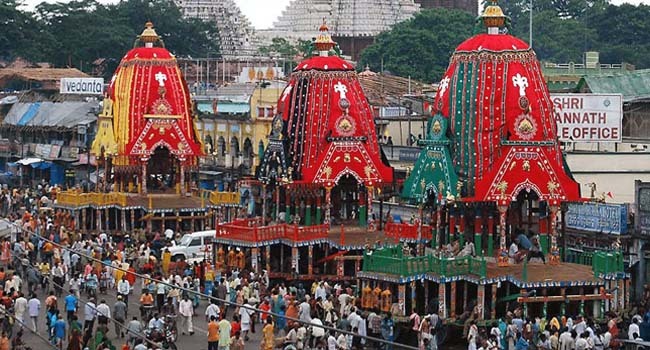 The centre of the Jagannath Puri Rath Yatra is the Jagnnath Temple, one of the four dhams or shrine of the Hindus. Incidentally, the name of the deity is also the root word of the English term 'juggernaut', which is used to describe any unstoppable force. The 12th-century Jagannath temple was commissioned by King Anantavarma Chodaganga Deva (1078 -- 1147) of the Eastern Ganga Dynasty, and is single-handedly responsible for making Puri one of India's most important religious centres. The day of the Rath Yatra in Puri is the only day in the whole year when the non- Hindu devotees can have an opportunity to see the gods and goddess of Jagannath Puri temple. All for the convenience of devotees, Ratha Yatra Puri Tour is largely organized in the country and, every year, tourists from other countries take part in Puri Yatra. Holiday India organizes customized tour to the Lord Jagannath Ratha Yatra in Puri.